Aidan is my inspiration right now. He’s amazing. I received this beautiful, inspirational email from a guest at the Westin Hotel. It brought tears to my eyes. I’m sharing it here with permission. You do not know me but I know of you and you have been an inspiration to me for quite some time . My name Is Dale C., I am an airline pilot for a major airline. One of the trips I love to bid is Toronto. We stay at the Westin harbour castle hotel. It was probably sometime in 2010 or 2011 while I was working out on the elliptical where you can look down on the pool area. I first saw you at the pool with your trainer who I was told was your aunt but after reading your story it may have been your mom. I was sadden as I watched you struggle with your training but was inspired with your determination and the joy in your face and the patience and obvious love of your trainer. I continued to watch you the rest of the week and would plan to make sure I timed it so I was on the elliptical machine so I could watch you. You were awe inspiring to me and you brought me to tears more than once. When I came back a week later I watched you again and this continued throughout the next couple of years. It got to where I looked forward to going to the workout room because you always brought a smile to my face and sometimes a tear and a lump in my throat as I watched you develop and improve. Then in 2012, I was diagnosed with mixed phenotype acute leukemia, and I started my own battle fighting the cancer that was trying to take my life. It was a hard long battle with all the complications you might get with all the chemo treatments and such. There were days I thought I just couldn’t go on, that the journey seemed too long too hard, but then I would think back to Toronto working out on the elliptical watching this amazing little boy struggling to literally keep his head up in 3 feet of water. Somehow even though I was on deaths doorstep a few times it didn’t seem so tough or long. I could do this journey, I could overcome this. I thought of you throughout my battle and you helped me overcome some fears and inspired me to have a more positive attitude as I battled this dreadful disease. After two years and with a bone morrow transplant from my sister I am by the, grace of God, in remission and remarkably back to work doing what I love to do: being an aviator. I returned to work in May of 2014 and the first trip I bid was Toronto. I cannot begin to tell you how happy I was to see you that first time back. I had a tear in my eyes and a lump in my throat as I watched you in your training. I was in Toronto This last week for the first time in several months and was disappointed when I did not see you. I finally asked the girl there about you and she said that you were doing different training at a different facility. I was sad that I don’t get to see you anymore but glad you are advancing in your training. She was kind enough to give me your web page address and this is how I got your email address. I wanted to tell you this story because you touched my heart. Even though you do not know me, you affected me in a profound way. I believe God has a plan for all of us and he directs us along our life’s paths to meet certain people. I believe this was not an accidental meeting it was God’s plan. And even though we have not formally met God allowed me to see the courage and determination of a little boy in a swimming pool and for that I will always be eternally grateful. God speed and good luck in your training and therapy, Aidan. Since October 2013, Aidan has been doing private classes at the Spiral Movement Center with a goal to get him walking independently. He’s shown great progress. Now he can crawl and roll and go up into high kneeling — all things he couldn’t do before starting at the Centre. In March 2015, I decided to discontinue his swim lessons and put all of our resources into getting him walking with the Spiral Movement Center. Aidan will be working very intensively on walking over the summer. I feel very hopeful. 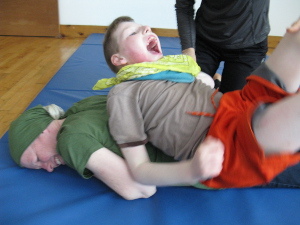 Rolling with a partner at the Spiral Movement Centre. Aidan standing on his own! Here’s Aidan standing with both feet flat on the floor! Working with Yuji Oka at the Spiral Movement Center. VHA made this short 2 minute video of me and Aidan for their Heart of Homecare award ceremony last week. 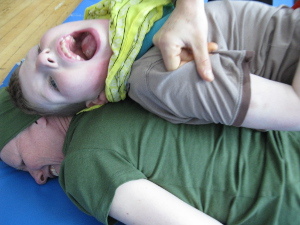 Aidan started working with Yuji and Stephanie at the Spiral Movement Centre in November 2013. This is in addition to swimming. Here is a video they did in March 2014 of Aidan learning to crawl.